"If we want to be the global leader in combating HIV/AIDS, we need to act like it," President Obama said Friday. 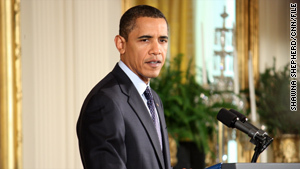 Washington (CNN) -- President Obama announced Friday that he will lift a 22-year-old ban on entry into the United States for people infected with HIV/AIDS. The administration intends to publish a new federal rule next week eliminating the ban by the start of 2010, he said. "We talk about reducing the stigma of this disease, yet we've treated a visitor living with it as a threat," he said at the White House. "If we want to be the global leader in combating HIV/AIDS, we need to act like it." Obama said that lifting the ban is a "step that will encourage people to get tested and get treatment. It's a step that will keep families together, and it's a step that will save lives." The United States, he said, is one of only a dozen countries that still bar the entry of people with HIV. Obama made the announcement shortly before signing legislation extending federally funded HIV/AIDS treatment for hundreds of thousands of underinsured, low-income Americans. The Ryan White HIV/AIDS Treatment Extension Act authorizes a 5 percent annual increase in federal support over the next four years. Funding under the law is scheduled to rise from more than $2.5 billion in fiscal year 2010 to nearly $3 billion in fiscal year 2013. Among other things, the law helps ensure continued funding for the Minority AIDS Initiative, designed to address "the disproportionate impact of the disease on racial and ethnic minorities," according to a White House statement. The measure easily passed both the Senate and the House of Representatives last week. Similar legislation first passed almost 20 years ago and was reauthorized in 1996, 2000 and 2006. Physicians for Human Rights, which shared the 1997 Nobel Peace Prize for its efforts to ban landmines, described the policy change as "monumental." "Today is a great day for human rights and for people living with AIDS, their friends and their families," said CEO Frank Donaghue. "The HIV Travel Ban made the United States a pariah in human rights circles, and harmed our reputation as a world leader of HIV/AIDS prevention, treatment and care. "Starting in 2010, people living with HIV will no longer be prevented from entering this country, no longer turned away at customs, no longer forced to hide their condition and interrupt medical treatment, and no longer be treated by our government with contempt." An estimated 1 million people in the United States have HIV, according the Centers for Disease Control and Prevention. Almost one-quarter of them are not aware that they are infected, the CDC says.